The city of Mobile, Alabama, is re-asserting itself as an arts and cultural center and the University of South Alabama is in concert with the plan. In order to rejuvenate, attract, and draw potential students, the university built a new 130,000 sq. 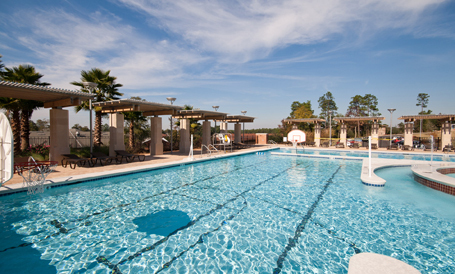 ft. Student Recreation Center that includes aerobic rooms, weight rooms, spinning rooms, basketball and racquetball courts, an indoor track, indoor and outdoor pools, saunas, and a rock-climbing wall. A reflecting fountain pool with an infinity edge and sculpture pedestal situated at the entry of the recreation center welcomes students to the center. Designed by Counsilman-Hunsaker, Sasaki, and WHL Architecture, the university is among many higher education institutions to capitalize on an aquatics design trend that provides maximum aquatic enjoyment and use to its entire student population. Counsilman-Hunsaker is also providing aquatic design services for an 850 sq. ft. reflecting fountain pool located on the upper terrace of the recreation center. The fountain incorporates a perimeter infinity edge 12 in. high above the upper plaza with a sculpture pedestal at one end.